Gettin’ Sauced is just around the corner! Just bought my ticket! I recently went on a BBQ tour with Man Up Texas BBQ. If this festival is anything like that trip…well let’s just say pay the money. I’ll guarantee you have fun. Gettin’ Sauced! 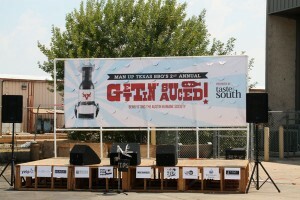 is an annual BBQ sauce contest and festival in Austin, Texas. Taste sauces, & pick your favorites. Listen to live music in the Live Music Capital of the World. Enter to win door prizes. Cool off with a cold drink. And meet with BBQ joints & sauce vendors. A perfect way to spend a Saturday! Festival is from 3:00 PM to 6:00 PM.